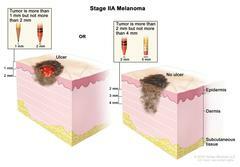 Three-panel drawing of stage II melanoma. The left panel shows two stage IIA tumors. One tumor is more than 1 but not more than 2 millimeters thick, with ulceration (break in the skin); the other tumor is more than 2 but not more than 4 millimeters thick, with no ulceration. The right panel shows two stage IIB tumors. One tumor is more than 2 but not more than 4 millimeters thick, with ulceration; the other tumor is more than 4 millimeters thick, with no ulceration. The bottom panel shows a stage IIC tumor that is more than 4 millimeters thick, with ulceration. Also shown are the epidermis (outer layer of the skin), the dermis (inner layer of the skin), and the subcutaneous tissue below the dermis. In stage IIA, the tumor is either more than 1 but not more than 2 millimeters thick, with ulceration (break in the skin), OR it is more than 2 but not more than 4 millimeters thick, with no ulceration. In stage IIB, the tumor is either more than 2 but not more than 4 millimeters thick, with ulceration, OR it is more than 4 millimeters thick, with no ulceration. In stage IIC, the tumor is more than 4 millimeters thick, with ulceration.